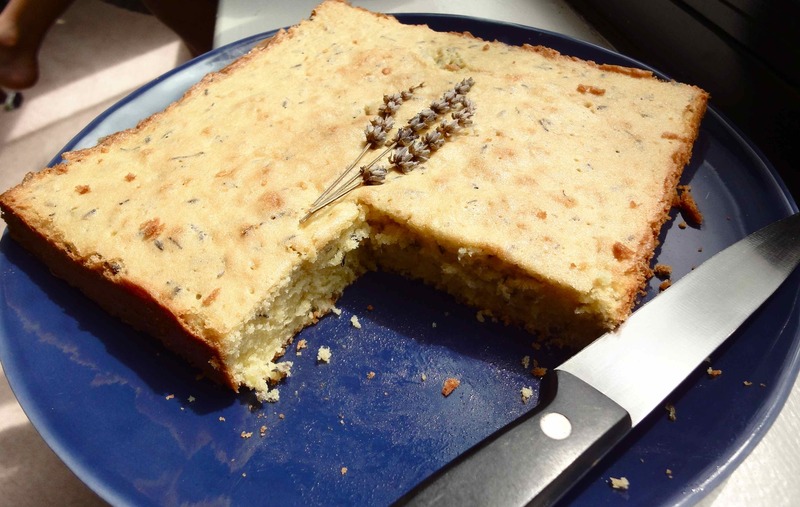 In June last year, I found a lavender pound cake at the Rhinebeck Farmers Market. I had never encountered lavender in a cake before, and this cake had a sprig of lavender pressed into the middle. It looked both romantic and rustic. Slices of this buttery pound cake went wonderfully well with cups of English breakfast tea or masala chai. It had bits of lavender that burst into full flavor in my mouth. It’s June again, and I’m sure that lavender is in full bloom here in the northeast. My thoughts keep turning to lavender cake and the promise of summer and romance that each tiny petal-scented bite might hold for me. I’ve adapted a basic pound cake recipe from Martha Stewart’s Baking Handbook for this cake. I recommend leaving the butter out to soften overnight for this cake, and also keeping the eggs out for a little while to get them to room temperature before using. Use an electric mixer, beat the sugar and butter well first, and then incorporate the eggs fully into the fluffy batter one by one, along with the vanilla. Fold in the flour, salt and lavender gently into the batter. The cake is best made in a 9 by 5 loaf pan, but here I’ve used an 8″ square pan. The scent of lavender will fill your home as the cake bakes. 1. Heat the oven to 350F. Butter and flour a 9 by 5 loaf pan. Whisk the flour, salt and lavender and keep aside. 2. With an electric mixer on the lowest setting, beat the sugar and the butter for 3-4 minutes until light and fluffy. Add the eggs, one by one, beating each until fully incorporated into the batter. 3. Fold in the flour mixture gently into the cake in three parts. Place into prepared pan and bake for 30-40 minutes, until the sides of the cake move away from the pan, the top turns a warm golden and a knife inserted into the cake comes out clean. Cool completely, and turn out of the pan. If you’d like to place lavender flowers on top of the cake, do so midway through baking, when the batter looks somewhat firm. Vrushali, would love to know how it turned out and whether you used fresh or dried lavender.